Ecommerce Magento Design Online Bookshop is a clean Magento responsive design best for book stores, libraries, book shops, ebooks. It is compatible with many modern mobile devices as well. It is along with the custom functions and a beautiful design, Ebookshop magento web design is the best face for your choice. The products are neatly arranged in the product sliders such as featured products slider, new products slider, upsell products slider.Your customers are not confused when visiting your store. They will enjoy the ecommerce unique functions, they can shop faster, this is really interesting things. 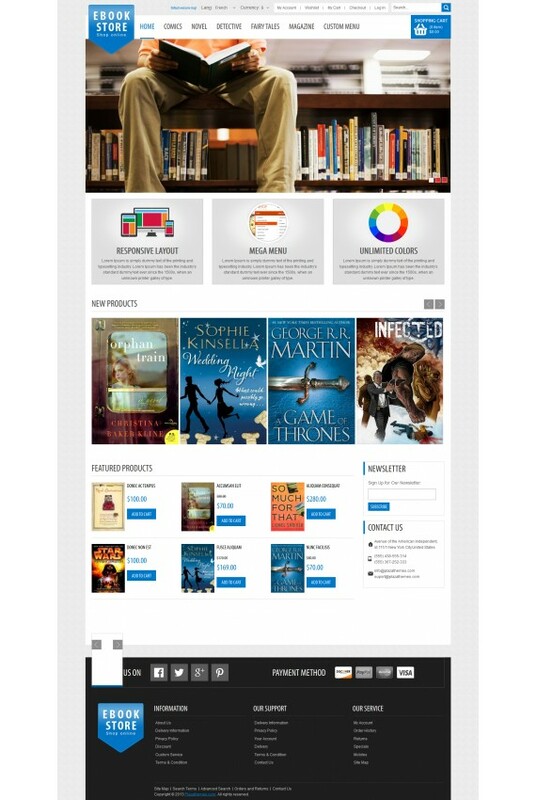 Indeed, we have integrated many interesting extensions for Ebookshop such as the image slideshow gallery, ajax cart, layered navigation ajax, Custom menu with many multiple columns styles, cloud zoom java script effect,… Besides the optimal structure, the design of Ebook shop also succeeded in the color of design. With 6 colors : red, blue, pink, orange, green, brown, Ebookshop provides you 6 attractive options. You can easily find a style that you like best. Contact us if you like this design and want to start online book store. eCommerce Web Developer WordPress Design . Outlet is the latest and most advanced addition to the pool of eCommerce WordPress themes. It has 14+ accomplished homepage layouts, each uniquely furnished and fresh in look. eCommerce Web Developer WordPress Design. You can use it for any and every kind of online shopping outlet. Here you have dozens of innovative features, including Advanced Filter Search, AJAX-Powered Cart System, and numerous Products Posts Styles. All the Products Grids support carousel function. So, present every type of item in a unique and impressive way. There are 6 decent headers with sticky option and tens of other customization options. Two vertical side header styles can be made to remain sticky or sliding in from left. It is not just the rearrangement of sections or other minor variations, each of the 18+ furnished and accomplished layouts it totally unique in its design as well as functioning. Also these are all further customizable to any extent. Lots of Product Styles Different items, such as fashion products, bags and shoes, have their own requirement for presentation on a homepage. Mindful of this fact, we have provided lots of unique product styles. So, do justice with all of your products. Look Book Design The decently designed look book can not only be used on the homepage as a section, but also you can apply this shortcode on separate inner pages. These can be used to display seasonal products collections, such as summer collection and winter collection, etc. Beautiful Widgets Lots of useful widgets have been placed in various parts of all the homepage layouts, including sidebar and footer. They all are full of functioning power. You can use them for multiple purposes. Each can be further customized as much as you want. 100+ Shortcode Lists The beauty and specialty of each of the 100+ ready to use shortcodes lies in the fact that it is provided with hundreds of customization options. So, you can quickly reshape their look and functionality as a whole. Also, each shortcode contains options for light or dark skin, parallax and carousel options. Light and Dark Skin for Every Section If you want to start fashion or other type of store in dark skin, do it with a single click! There is also option to switch it back to the light version. It all depends on your taste and the appearance of the products post, so that it can be made more and more attractive.